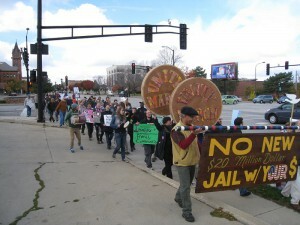 The ninth annual Unity March, held by CU Citizens for Peace and Justice (CUCPJ), took place on October 20, 2012. 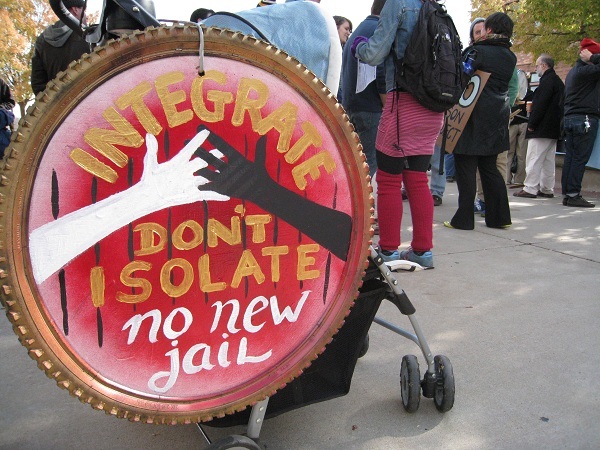 This year’s march brought attention to the current proposal before the county board to expand the jail system. 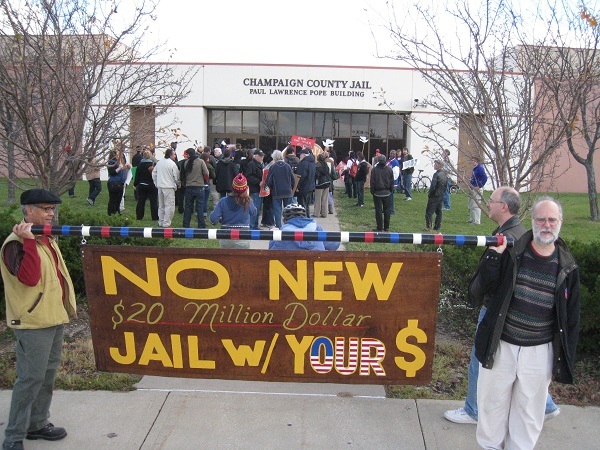 Champaign County currently has two jails, one on Main Street in downtown Urbana, and the other on Lierman Street in east Urbana. Sheriff Dan Walsh says it is too difficult for his deputies to shuttle back and forth between the two jails. He is advocating that the county board spend upwards of $20 million to expand the satellite jail and close the downtown jail. To point out the absurdity of this proposal, CUCPJ marched from one jail to the other, a route less than a mile and a half. The crowd of people assembled on the plaza in front of the Champaign County Courthouse, just across the street from the downtown jail. 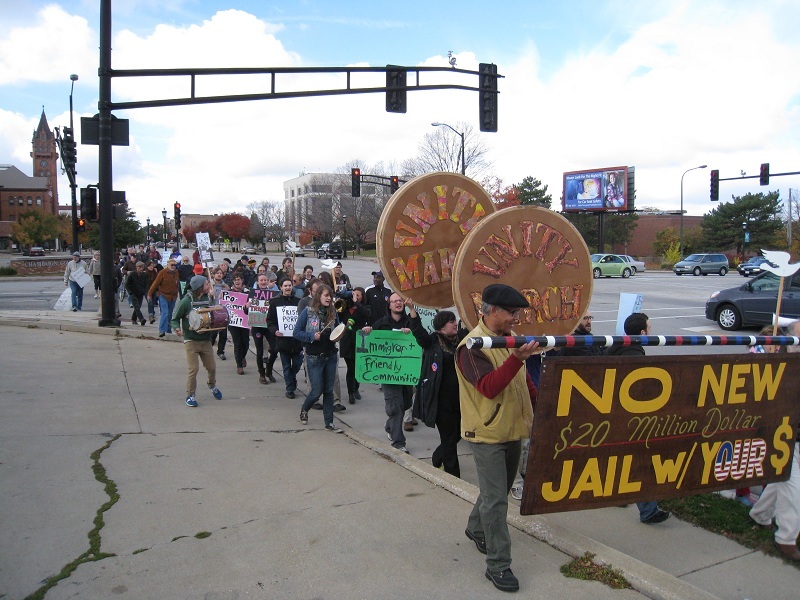 Several groups joined in the Unity March this year including the Immigration Forum, GEO, Breakfast Club, Citizens With Conviction, Jobs With Justice, and others. They marched east down Main Street toward the satellite jail. 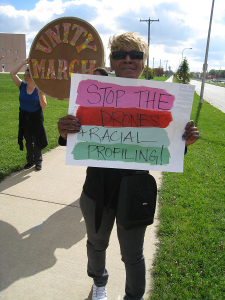 Linda Turnbull, of Champaign, has been outspoken about the recent discovery that Sheriff Walsh is operating a drone. She stands holding her sign denouncing its use for racial profiling. In all about 70-100 people turned out for the march. At the end, they stood outside of the satellite jail chanting “No New Jail!” for those inside to hear.